From the Berlin-based print sales site Lumas.com. The edition of one hundred 20 x 30" Lambda prints is sold out, but there is an open edition of the $140 15 x 20" version. Note that Lumas does not accept portfolios for review. That is totally killer and totally inspiring. I wonder if you have any clues about how that is lit? I'm thinking a very large softbox, right behind and slightly above the camera. But I have no idea other than that is smoking. "That is totally killer and totally inspiring. I wonder if you have any clues about how that is lit? I'm thinking a very large softbox, right behind and slightly above the camera." That or maybe ringlight. Look at the eyes--you can take a hint from the old studio pros, who, whenever they got a chance to see a competitor's chromes, would immediately put a loupe on the subject's eyes, where they could see the lighting reflected and figure out what lighting was used. Don't think its a ring flash, more likely a very large softbox. 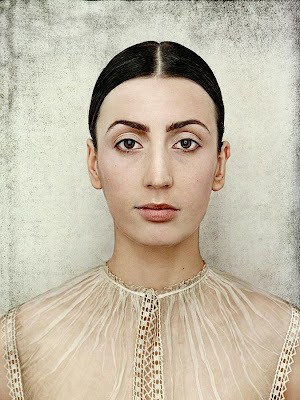 Its quite subtle quite different from say Martin Schoeller's Big Head series which I also find captivating.